or tablet. It is a free download at Apple's Newsstand and Google Play. On the go? Take it with you! 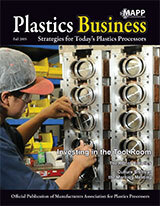 Get Plastics Business on your smartphone or tablet through Apple's Newsstand and Google Play. It's a free download. Get our monthly digital newsletter delivered right to your inbox. To sign up, or manage your ENews account, please click here. Visit Plastics Decorating for the latest news and developments in the plastic assembly and decoration industry.